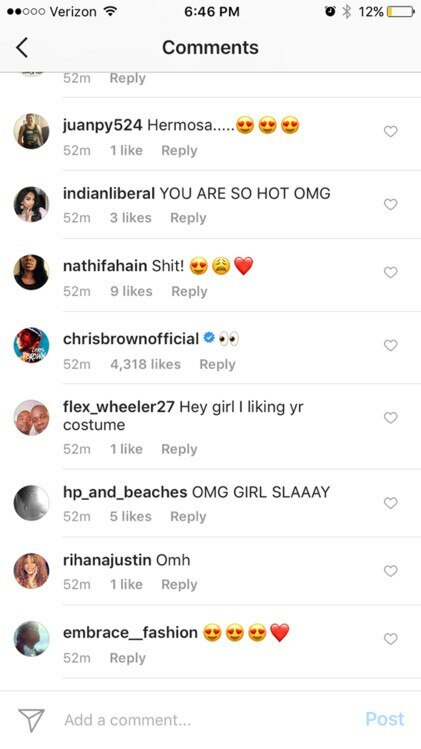 Chris Brown Made A Comment on Rihanna’s Latest Instagram Photo & The Internet Is Set Ablaze! Rihanna is shining the bright light a diamond and Chris Brown can’t seem to look away. As the “Umbrella” singer continues to work, work, work, work it at Barbados’ Carnival, one look is grabbing the attention of one famous ex. On Monday night, Rihanna posted one of her outfits from the annual event with a standard caption. Through all the likes and comments from fans and followers, one message stood out from all the rest. As it turns out, ex-boyfriend Chris decided to comment with two eye emoji’s. In less than an hour, more than 4,000 people had liked the comment. As the same time, there were plenty of naysayers who were left wondering why he wanted to leave his mark. One fan took it a step further and brought ex-boyfriend Drake into the mix. “@champagnepapi so you just gonna let Breezy comment on your girl’s pic like it’s all good?” the follower asked. As pop culture followers know, Rihanna was a victim of an assault at the hands of Chris back in 2009. It resulted in a makeup and then a final breakup.